The fascinating history of the restaurant chain you've never heard of. Long before Trader Joe's became the premier dietary status symbol of the well-to-do, there was Trader Vic's, a restaurant/bar chain that fit snugly into America's culture of unintentional post-WWII kitsch; a restaurant the whole family could enjoy and one that Mamie Eisenhower might disapprove of as being too foreign. 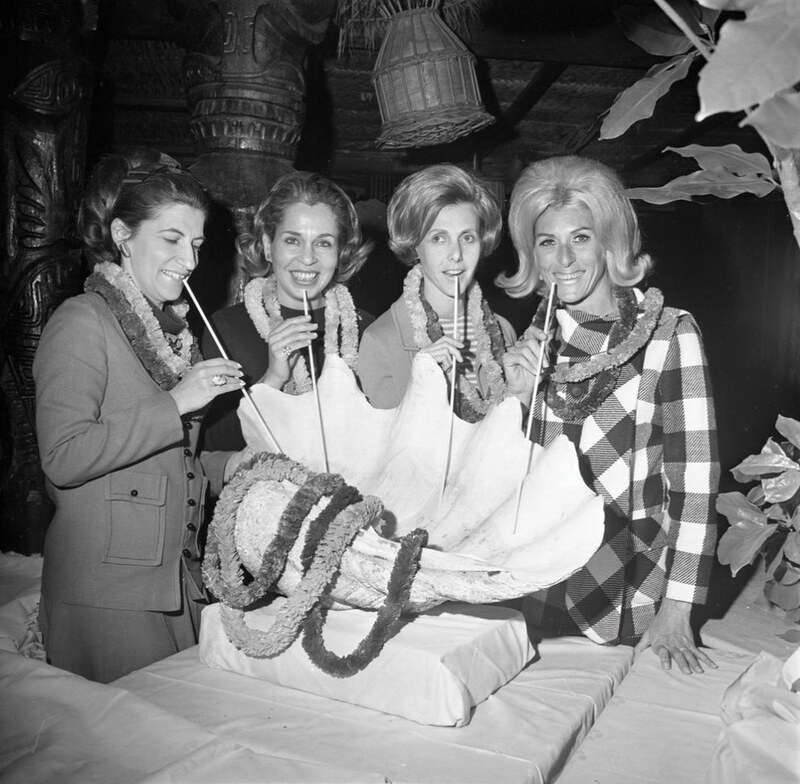 Trader Vic's, a product of California's "Surf City U.S.A." heyday, was a "tiki bar" during the island-life craze of the 1950s and 1960s; the physical embodiment of a Beach Boys 45 and a genuine California tan. 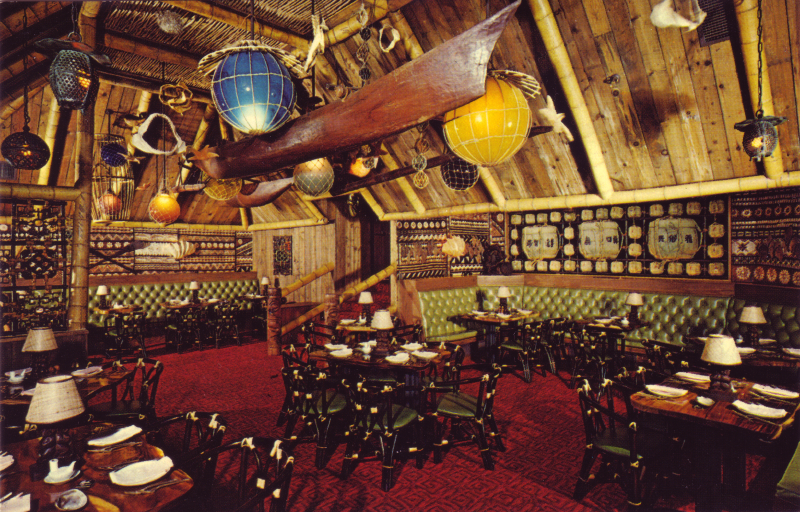 The decor was a knowingly tacky combination of Polynesian relics and heavy English wooden furniture, plush leather banquettes in varying shades of green and mile-thick, wall to wall shag carpeting, and for years it served as stiff competition to Don the Beachcomber, another highly popular, similarly-themed chain (with each owner claiming to be the creator of the Mai Tai). However, while Don the Beachcomber may lay claim to kicking off this fad of palatable exoticism (today it would simply be called cultural appropriation; the opening might even draw protesters), Trader Vic's extended far beyond the confines of America's borders and became a global sensation. Despite, or perhaps because of the laughably unhip decor, the in-crowd and clueless tourists alike flocked to locations in Japan, Cuba, Germany, England, and, over time, the UAE, Jordan, Thailand, India, and China, not to mention the dozens of locations scattered across the United States for more than five decades. And then, like any other fad, it passed. 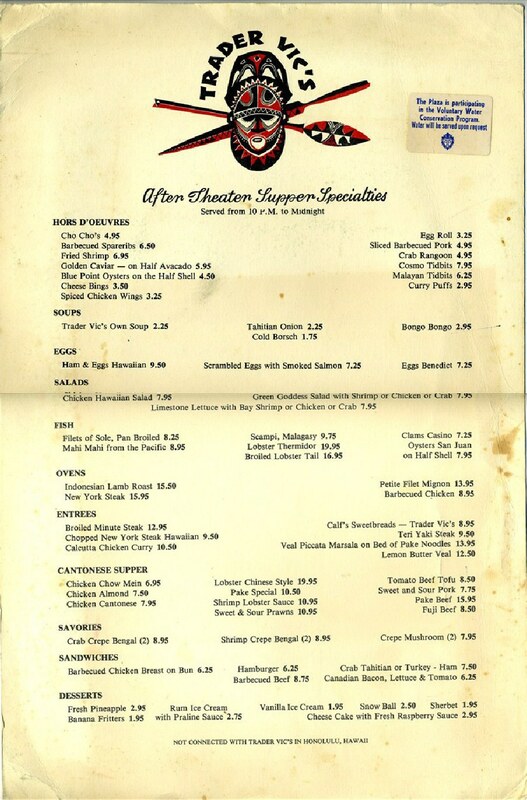 By the late 1970s, the kind of wink-wink, nudge-nudge humor offered up by Trader Vic's was eschewed in favor of the encroaching excess which marked the Reagan years - save for the Trader Vic's of Havana, which was closed in 1959 on account of Castro's rise to power - and one by one, Trader Vic's began closing their doors (in 1993, Donald Trump closed the Trader Vic's after purchasing the Plaza Hotel, claiming it was too "tacky"). Today, the vast majority of Trader Vic's are located in the United Arab Emirates, with only two locations (Atlanta and Emeryville, California) operating in the United States. This in itself is not so striking, as American exports usually have hilariously long expiration dates in far-off lands. But Trader Vic's has refused to accept its obsoleteness. Between 2004 and 2008, eight different Trader Vic's opened across America. By 2011, all of them had permanently closed. The most recent incarnation, the Trader Vic's of Los Angeles, opened its doors in 2009 only to close by 2014. The chain's refusal to lie down and stay down is endearing, if not pitiable. Why shouldn't this declassé, faux-tropical locale, long abandoned by the jet-set crowd of the Swinging 60s get another moment in the spotlight? More utilitarian restaurants like Chili's and TGI Friday's have blossomed and thrived in the wake of Trader Vic's demise, with hundreds of locations found in the remotest corners of the world, while The Rainforest Cafe, ingratiatingly replete with animatronic gorillas, simulated jungle sounds on a hellishly infinite loop, and palm fronds swatting inattentive diners in the face between courses has thrived domestically and abroad. These restaurants demonstrate the kind of all-or-nothing mentality which dominates modern taste. The general public would either prefer minimal ambiance, or be dazzled by a spectacle, than find a middle ground; a tasteful approach to camp/a tasteless approach to class. Trader Vic's will unfortunately never again be the hangout of the martini-swilling, Winston-smoking smart set, partly due to the extinction of that type of crowd. But for a once-mighty colossus with locations ranging from Arizona to Abu Dhabi and everywhere in between, Trader Vic's deserves some kind of recognition as the rarity that it is: something that was, even for a fleeting moment in time, beloved by the world. How many other restaurants can say that?